Former AOL head of video sales Alicia Elliott has been hired to lead Canadian sales operations for Virool, a California tech company specializing in native video solutions. Virool serves both media buyers and sellers, offering tools publishers can use to run in-line video ads, and then selling the resulting impressions to advertisers via its network. With only so much video pre-roll inventory available, publishers have turned to native video (also called in-text, in-line or out-stream) technologies like Virool to inject video ad spaces into text- or image-based content. Native video ads typically run between paragraphs of an article, expanding and autoplaying silently and pausing when the reader scrolls off the page, much like a native video on Facebook or Twitter. Native video serves as a way for publishers to meet advertisers’ seemingly insatiable demand for online video impressions without being as intrusive as a page takeover or pop-up. “We all know how expensive it is to create video content, and ultimately what a lot of folks are finding is they don’t have the budget,” said Elliot. “So [native video] is a nice way to make sure there is enough video ad inventory to get ad dollars on every single page,” said Elliott. Virool also sells Canadian ad traffic on behalf of international publishers like Yahoo, Mashable, The New York Post and Adweek. On the demand side, Virool has a partnership with the Rubicon Project to sell its inventory via programmatic and non-programmatic guaranteed direct channels. Although Canadian media buyers still don’t generally consider in-line to be as “premium” as preroll, it’s gaining popularity as an inexpensive way to extend preroll campaigns, especially since in-line videos have viewability rates close to 100% and above-benchmark CTRs (Virool says 2.5% on their units, compared to 0.8% on preroll). Advertisers that work directly with Virool also have access to data insights gleaned from 22,000 campaigns and a unique facial micro-expression analysis technology that Virool uses to understand how consumers react to videos they watch. Given a viewer’s explicit permission via a dialog box before the video plays, Virool can monitor their reactions and assess how the video made them feel, to get a better idea of the kind of quality advertisers are getting out of engagements. Elliott has experience in Canadian media sales with a specialty in online video. Before joining AOL early last year, she was an account director (and Canadian employee number two) at video platform Brightroll, which she describes as her first experience in building up a satellite sales department from scratch for a new technology company. Prior to Brightroll, she’s also worked in sales at Postmedia, TC and Rogers. Virool isn’t the first company to bring in-line video to Canada, and it will face some stiff competition for the nation’s top publishers. In March, Marketing reported that Torstar, TC and Postmedia were testing in-line video units created by Slimcut Media, a European startup with its North American headquarters in Toronto. 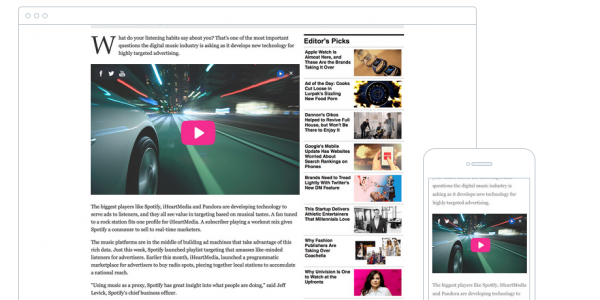 Another well-known provider is Teads, which provides in-line advertising for Forbes and Slate.